The China Syndrome (1979) was, for a time, more famous for issues surrounding it than the movie itself. When this thriller was first released, it received mixed reviews. Newsweek called the film “emotional manipulation”, while the New York Times said it was “less about the laws of physics than about public and private ethics”. The film, about a malfunction at a nuclear power plant, was also accused of trying to shape public debate about nuclear energy. The nuclear industry was unhappy with the film, too. They dismissed The China Syndrome as unrealistic. But get this. Not two weeks after the film’s release, there was a nuclear accident, a real one, at the Three Mile Island plant in Pennsylvania. It was the worst nuclear accident on American soil. At first, filmmakers were accused of staging the accident as publicity. Then critics said if the Three Mile Island accident had not happened, The China Syndrome would have been long forgotten. It’s almost as if everyone wanted this film to fail. Which would have been a shame. For one thing, the film has a tense Looming Disaster script that asks probing questions about nuclear energy. The casting is also superb. Jane Fonda stars as a television journalist craving her first hard-news story, and Michael Douglas plays an anti-establishment cameraman who knows Trouble when he smells it. 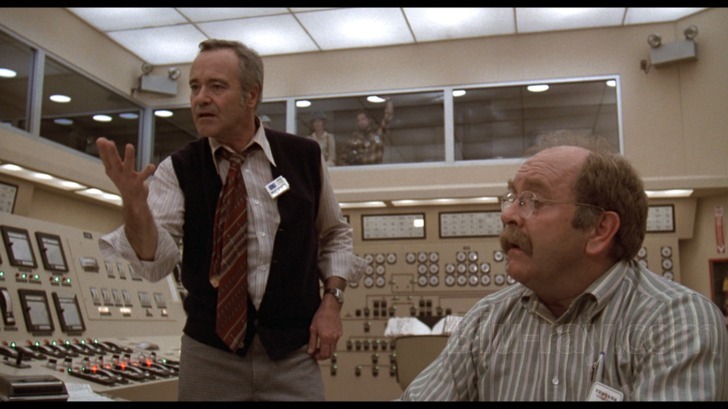 The most remarkable character, in our opinion, is the unassuming shift supervisor at the nuclear facility, played by Jack Lemmon in an Oscar-nominated performance. On the surface, Lemmon’s character is a slightly dented middle-aged man whose job anchors his life. But his rumpled exterior belies a sharp, resourceful mind. Lemmon’s character is hardwired to solve problems, and it never occurs to him to not fix a problem. The extraordinary thing about Lemmon’s portrayal is we (the audience) learn all of these things about the character during his very first scene. Yet, this character fallible. 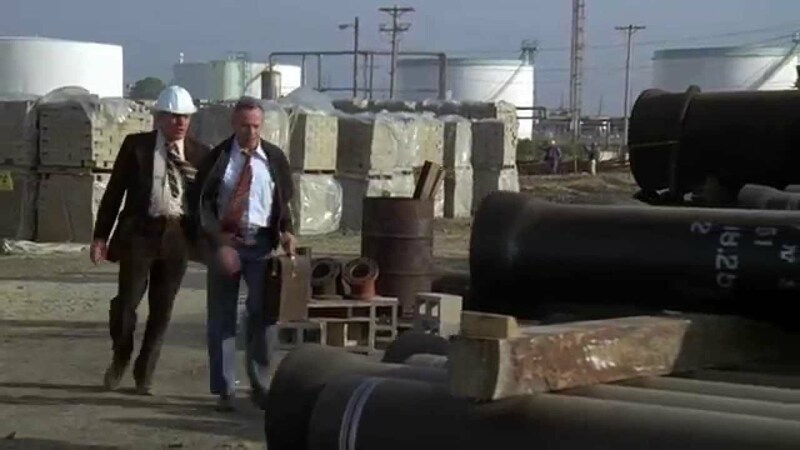 One of Lemmon’s most important scenes, we think, occurs late in the film when the facility is preparing for start-up. Lemmon is convinced the reactor is unsafe, and he’s barricaded himself in the facility control room. Fonda joins him so she can do a live On-The-Spot interview. When the camera crew arrives, she asks Lemmon if he’s ready and he, pale and nervous, says he is. But he’s not. It’s clear his character doesn’t understand television. When the live interview begins, Lemmon launches into a SCIENCE LESSON, for pete sake. We know he’s trying to frame the problem, but television viewers would need the gist of the crisis ASAP. Alas! Before Lemmon is properly able to explain the situation, the electricity is cut off. Lemmon gives us a powerful illustration of a man wanting to do right, yet he fails to grasp society has Moved On. There’s no time for education; even a nuclear crisis must be reduced to a sound bite. This is why Lemmon’s character is so stressed. He feels he can save the situation – that he must save it – but he simply isn’t persuasive enough. Lemmon’s desperate, riveting performance is infectious; we absorb his angst which ratchets the tension. This is one of our favourite Jack Lemmon films. If you haven’t seen The China Syndrome, we hope you can see it soon. 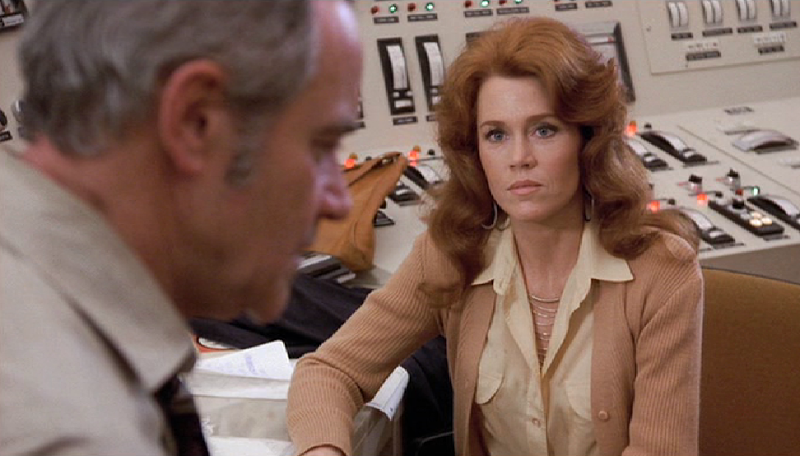 The China Syndrome: starring Jane Fonda, Jack Lemmon, Michael Douglas. Directed by James Bridges. Written by Mike Gray, T.S. Cook & James Bridges. Columbia Pictures, 1979, Color, 122 mins. This is part of The Jack Lemmon Blogathon hosted by Critica Retro and Wide Screen World. Great movie and it still works! Watching the actors work in The China Syndrome is a real treat. You said it. The entire cast is a treat, including those in supporting roles. Great post! This is a wonderful film and filled with great performances, as you mentioned. That scene you describe with Jack Lemmon trying to explain what’s going on conveys so much frustration and feelings of helplessness. It’s just another piece of evidence that Lemmon was a great actor. I actually remember when the film came out and news story when it broke. It made everyone want to go see it, which we all did! You’re right – every scene he appears in is proof he was one of the best. It must have been gruelling to play such an intense role. I had no idea about the history behind the animosity towards the film as well as the film’s controversy and connection to Three Mile Island. I was just mesmerized this film, and your description of Lemmon’s performance is spot on. I think a film about the making of this film would be really interesting, no? That’s really interesting about the film’s hardships. I’ve been wanting to see this film for a while since the combination of Lemmon, Fonda, and Douglas sounds fascinating. Your post just makes me want to watch it more. Great write-up. Michaela, you must see this film. It’s done well & is thought provoking, but even if weren’t, Jack Lemmon alone is worth the price of admission. The ‘New York Times said it was “less about the laws of physics than about public and private ethics”?’ I want to say, ‘So? That’s a bad thing?.’ I’m very fond of this film and Lemmon is majestic (as he so often was). I saw it at the time but I don’t think I was ever aware of just how much antipathy it engendered. I would always choose The China Syndrome over Silkwood for showing the nefarious goings on and the ethics of the industry. It packs a more powerful punch. Those who haven’t already seen it would do well to watch it because the world is getting far worse in this respect, certainly with you-know-who in charge. Excellent review, Ruth. I’m with you every step of the way. “Majestic” is a perfect description of Lemmon’s performance. Much of the film rests in his angst and he carries it well. As for the New York Times, iI agree! Isn’t a movie that encourages public debate about energy a worthwhile thing? I had to laugh at their We-Know-What’s-Best approach. I think Lemmon was one of the greatest of the greats. 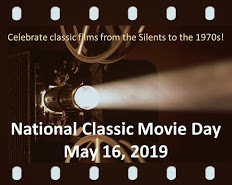 Whatever film you think of, The Apartment, Some Like it Hot, China Syndrome or even, as you say, Grumpy Old Men, he gave exquisite performances that bear watching over and over again. My parents introduced me to The Apartment and I’ve never looked back. The reactions to this film certainly belie Hitch’s comment about “it’s only a movie”. People certainly are touchy, aren’t they? 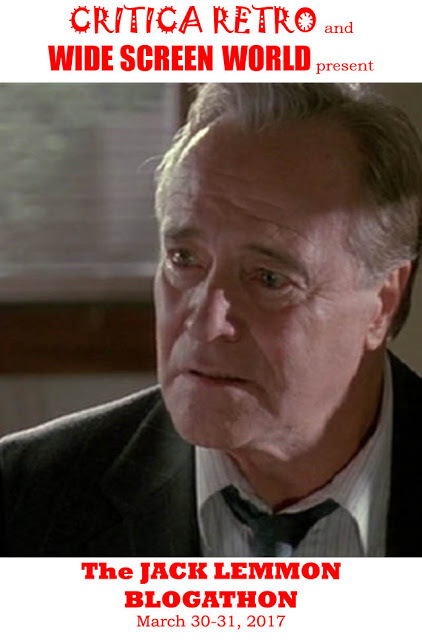 One aspect of The China Syndrome’s place in Jack’s filmography is that he always maintained a relevancy to the world around him, up to and including Grumpy Old Men. We lived many different lifetimes with Jack. Yes, Jack Lemmon was always relevant in his film choices and roles. I’d never thought of it that way, but you’re right. Yup, some folks were pretty touchy about this film, as you said, which I didn’t realize. In the bonus features on the DVD, both Michael Douglas and Jane Fonda talk about that. The experience must have been something, because they both talk about it with such detail, as though it happened last week. A nuclear meltdown as publicity stunt for a movie? Whoever thought that needed their head examined. Hey, thanks for co-hosting this blogathon. It’s a great tribute to a great actor. I think Jack gives one of his very best performances in this. I love the scene where Fonda and Douglas watch him in the control room and can see he is terrified about something that is unfolding. A film with many tense moments, and it certainly makes you question the wisdom of nuclear power stations. So true! It’s an incredible scene. It makes the audience very nervous, I think, because if things are this gripping when something doesn’t happen, what will it be like when it does? Exactly. I feel there is sort of Hitchcock feel to some scenes in this. Very suspenseful. I love pretty much anything with Jack Lemmon is in, and he just blew me away in The China Syndrome. It’s a film that still holds up, not just a taut, tense, frightening conspiracy thriller but also as a great human drama with an emotional punch. Agreed! It’s a film that doesn’t feel dated, and it’s just as relevant now as it was on 1979. As for Jack Lemmon, he blew me away, too, in this film. A mesmerizing performance. Great movie – loved Jack Lemmon, one of the best. He was an awesome story teller in theater and big screen. That’s a good way to put it, Mary. He truly was a great storyteller. I’ve never come across this movie, but the cast is fab – basically, if Jack Lemmon is there, I’m there! One for the to-watch list for sure – thanks!! I hope you get the chance to see this. It’s riveting! Everything about this movie is marvelous, in my opinion. Well worth a watch. A fine movies that holds up well today and it features one of my favorite Jack Lemmon performances. Agreed. Apart from the wardrobe and vehicles, this film doesn’t feel dated. I forgot that he was in this. I saw it days after the 3 Mile Island disaster. When a scientist character predicts Pennsylvania as a potential danger zone, a shudder went through the theater. By the way, Michael Douglas will be introducing the film at the TCM Festival this month. Yes, that was a bit chilling in the film to hear the scientist use Pennsylvania as an example. I bet that was quite something to experience that in the theatre! It’s been a very long time since I’ve seen this. Time to revisit. Strong cast. Think it was the first one I’d seen of Lemmon outside of comedy and saw that range! I also remember when those moments unfolded between the movie’s release and real life. For a kid, the connection was really creepy! Still is. Agreed. The movie was weirdly prophetic. I hope you get the chance to see it again. It would be interesting to see if you view the film differently now. Great post. I previously noticed you put this film as your choice to review for the blogathon, and has been waiting to read your post ever since. I haven’t seen this film, but this is definitely the one which appeals to me for many reasons, and hopefully I will be watching it soon. I am also not totally surprised about all the weird publicity surrounding the film’s topic. Nuclear energy is a very contested issue. Even though it can generally provide a stable energy supply (in contrast to renewable energy), omg if something goes wrong and there is a real risk of a disaster! Half the planet needs to be evacuated. You said it! It seems there’s a cost to any power-generating method, be it pollution, instability (eg solar in northern climates), the potential for nuclear disaster, etc. Real Life imitates Reel Life??? That’s Creepy!! Another movie I need to see!! I like how you put that. Yes, a movie about a nuclear accident that was released 2 weeks before a real accident is eerie indeed. It’s a fascinating film with lots of food for thought.